Holy cow! We're rapidly approaching C-Day! With this in mind, lovely Ms. December Monika's challenge is to make an ornament using our Bombshell Stamps. I decided to keep with my Muse Monday theme and made my ornament featuring the "Pin-Stripes" set. I was really bummed that I couldn't get a shot I like with it hanging on the tree - grrrrr. 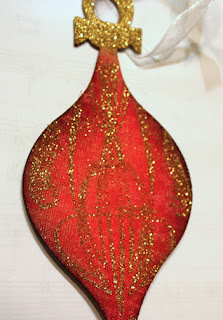 Anywho, I used some chipboard and sticky back canvas by Ranger, the die cut ornament is Basic Grey by Sizzix. I inked it up with Distress Inks, stamped it with Distress Embossing Ink and used Ranger's Gold Tinsel embossing powder. 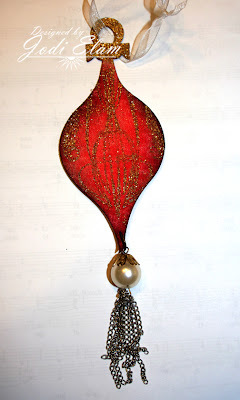 I used a dangly pearl from the Tim Holtz collection to add a bit more elegance. I'm really digging the Pin-Stripes stamp on it. It reminds me of some of my grandparent's old glass ornaments with the flourishes glittered on. So there you go, another way to use the Pin-Stripes set! Here's a little closer look at it. Still doesn't do it justice compared to the real thing. Make sure you join us in the fun and create a fabulous ornament! Make sure you add your creation to the inlinkz at the bottom of the post on the Bombshell Blog for a chance to win! I have one more post before Christmas! Jodi, great ornament. Thanks for playing along with the Get Ornamental Bombshell Stamps challenge this month. Love how you used the pinstripe stamps for some bling on a classy, but sassy ornament. That tassel at the bottom really just makes it.